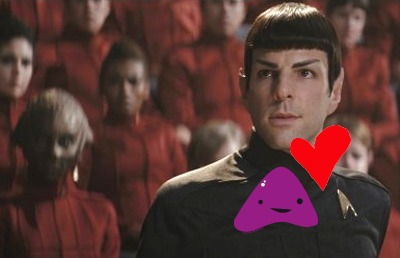 At the risk of sounding like a total geek, I have to admit I am super excited about the new Star Trek movie. Not just because I used to watch Star Trek reruns as a kid every Sunday, nor because I harbored a tiny crush on the sleazy Captain James T. Kirk, but also because I love the work of Alex Kurtzman and Roberto Orci, who wrote the screenplay for the new movie (they also wrote the television shows Fringe and Alias). Can't wait to see it. I also realized, while testing out our new lapel pins, that the adrenal gland pins look a lot like the Star Trek logo/communication device worn by all aboard the Enterprise. So get one and geek out. For awhile,I believed i was concerned Star Trek was a dying franchise. Then JJ Abrams came along. Great touch. The scene with kid Kirk was a touch too quirky in the movie, even though it was popular in the trailer. Star Trek XI breathed new life into this precious Roddenberry universe. I’d like to see all of this Enterprise cast return for further outings. I spent my youth with the first series. Heck, my pops got us a color Television just so we could look at Star Trek every single Friday evening. At this moment, I’m stuck on these new famous actors. In MHO, they have absolutely breathed life to their characters and made them their own. I, personally, am looking towards more.